Veronica “Ronnie” Royal of Virginia has been an iconographer since 1998, working diligently to hone her craft and encourage the use of icons in contemplation and prayer. Born in Nancy, France, she was raised in the Ukrainian Catholic Church by her Russian mother and Ukranian father. Icons were very much a part of her church and family life. She is often commissioned to paint saints who are not particularly popular or are obscure, like St. Andrew Kim Taegon, namesake of a couple’s adopted son. His grandmother commissioned Royal to paint the icon as a gift to her son and daughter-in-law in celebration of their new child, Taegon. “The Holy Spirit speaks to us through sacred art and allows us to gain an understanding of the subject’s experiences in the Christian journey that we are all undertaking,” Royal said in an interview. 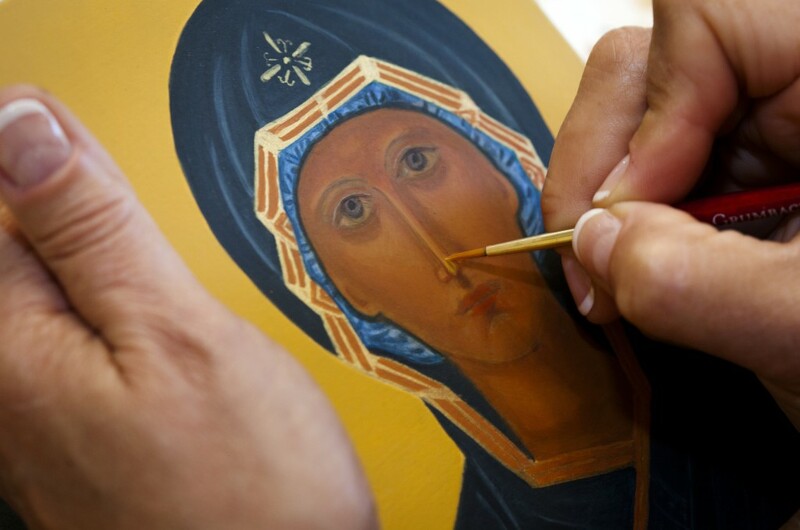 The general approach to painting an icon is to begin with a dry, knot-free piece of nonresinous wood and apply coats of gesso, which acts as a special primer. The outline of the icon is put on tracing paper and then powdered with a chalklike substance that can then be transferred to the wood’s surface by tracing each line. Gold leaf is then applied to key places such as the background or a halo, and then the painting begins. Royal has developed her own approach, which she teaches in her workshop. Royal has traveled the world to perfect her craft, including a recent visit to Greece to study for a month under an iconographer whose works she admires. As she has honed her craft, Royal said she still often uses the outlines of existing icons. She even examines the works of great masters to see how they depicted saints. Royal teaches students with varying skill levels during Saturday-morning workshops. Two or three artists often sit at her dining-room table with implements and tubes of paints spread about. At other sessions, there are up to seven iconographers with varying degrees of skill and expertise at work, some of them at the kitchen table. “I have two students who are exceptional — they could teach me,” she said with a smile.